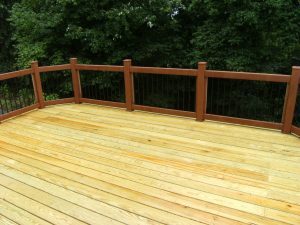 Thankfully, Quaker State’s answer to this question is typically “yes.” Many homeowners choose to have an extreme deck makeover in order to update the look of the deck, to convert it to low-maintenance material, and often, to change the size of the deck area. You may be wondering if a size change is possible, but it really is a fairly easy and feasible project, especially for the Quaker State team, which has over 50 years of experience in deck remodeling and construction. Whether you have a wood or composite deck, extending the space during an extreme deck makeover requires the same basic process. The construction team will take off the old wood or composite boards and ensure that existing footers and framing are up to code and safe, replacing anything that doesn’t meet building standards. After a building permit is obtained from the township, the team will install additional footers and framing that properly support and flawlessly connect the extra decking to the existing structure. From there, the deck replacement continues with new boards, railings, and finishing accents being installed. The final result is a larger deck with a modernized look. The deck gets a makeover and extended space without the homeowner incurring the high cost associated with installing a brand new deck. Interestingly, some homeowners start with a large deck and find that they don’t need or use some of the space. In this case, Quaker State can actually cut back the size of the deck during an extreme deck makeover. By simply removing framing and footers, the deck size can be reduced to leave homeowners with a manageable yet useful space. The only rare cases in which a deck extension cannot be completed are if the township has a zoning confinement and will not issue a building permit, or if space or landscape of the property will not safely accommodate the additional footers and framing that would need to be installed. What are the Resizing Options? Bump out-This small addition creates a designated space for a grill or smoker. With a bump out, you’ll no longer have seating or lounging area being taken up by an appliance. Extend-This addition will add more space to one side of your deck, creating more room in one direction rather than expanding the deck on all sides. Gazebo– A gazebo is a beautiful and functional addition to make on a deck. Gazebos allow you to enjoy the outdoors while protecting you from rain or intense sun. If the gazebo is big enough, you can set up a table and chairs for an intimate meal. A screened in gazebo will also keep the bugs out on humid spring and summer days. Add Square Footage-This addition involves expanding the deck on all sides, leaving you with the space you need to relax, entertain, and enjoy friends and family in your outdoor space. No matter what you want to do to extend your deck, the professionals at Quaker State Construction will design and build a beautiful addition that will serve you and your family for years to come. If you’re considering a deck extension, contact Quaker State at 800-262-DECK to schedule a consultation.